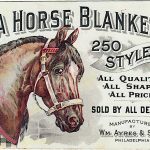 Articles and blogs exploring the fascinating and historically important products and brands of the Victorian era. 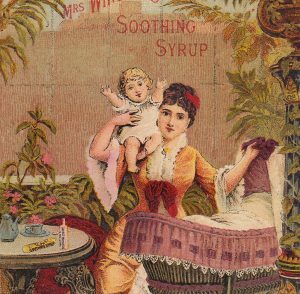 Mrs. Winslow’s Soothing Syrup was a Victorian-era patent medicine guaranteed to quiet a crying infant. 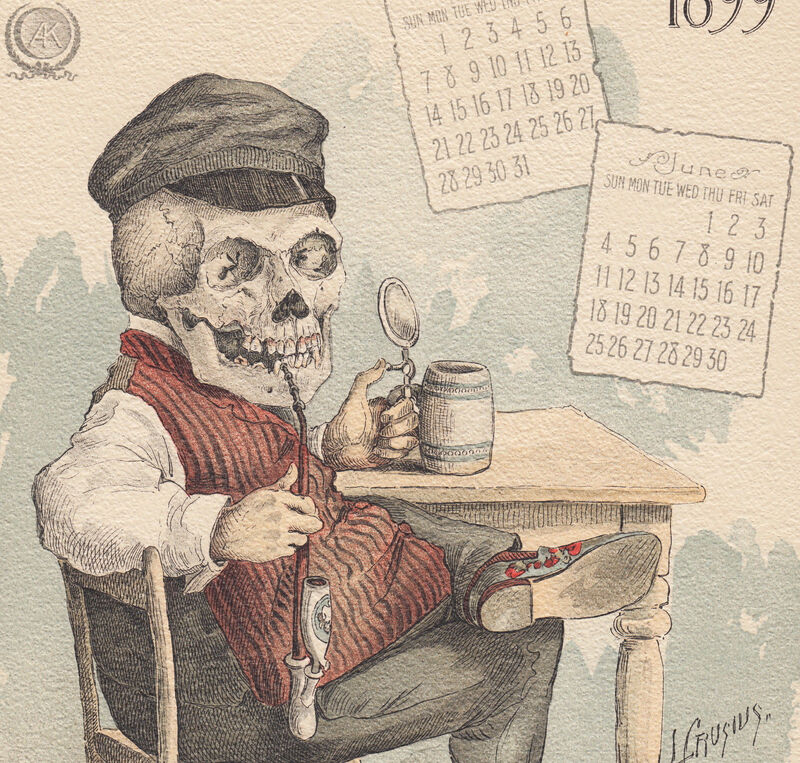 The problem, of course, came when the morphine of the deadly teething syrup wore off. As the baby stirred from a deep slumber, the infant would inevitably wail for another dose… if the baby ever woke at all! 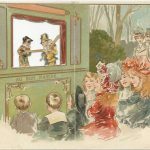 Whether administered by a mother, sister, housekeeper, or Mary Poppins herself, Victorian babies stopped screaming after a dose of Mrs. Winslow’s pain killer. 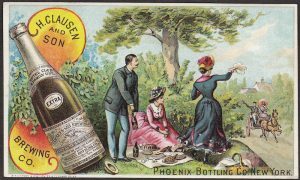 Like many bottled cures of the day, the Winslow’s Syrup label failed to mention the magic of the remedy was found in the addictive drugs it contained. 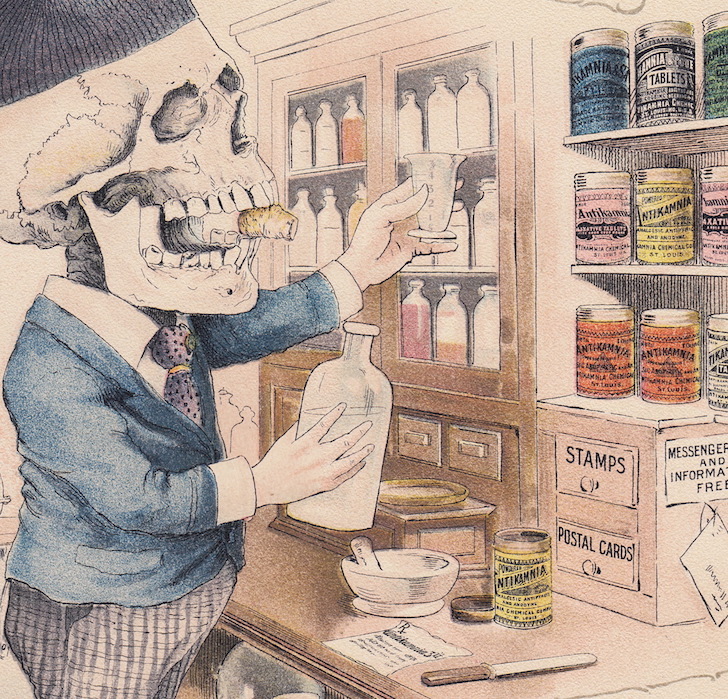 According to A. Walker Bingham’s 1994 book, The Snake-Oil Syndrome, Mrs. Winslow’s was just one of many baby medicines that contained potentially lethal ingredients. 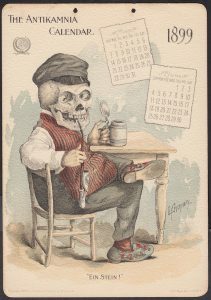 Among other top selling “family medicines” of the late 1800’s were James’ Soothing Syrup, Seth Arnold’s Cough Killer, Dr. Bull’s Cough Syrup, Ayer’s Cherry Pectoral, and Dr. King’s New Discovery, all of which contained alcohol and morphine, opium, or heroin. But on account of massive marketing campaigns and the millions of bottles they sold, Mrs. Winslow’s remains one of the most infamous of the “baby killer” bunch. 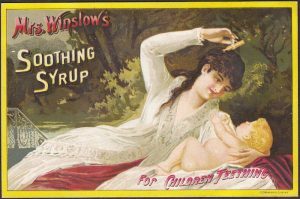 According to Wikipedia, Mrs. Winslow’s Soothing Syrup was a medicinal product formula supposedly compounded by Mrs. Charlotte N. Winslow, and first marketed by her son-in-law Jeremiah Curtis and Benjamin A. Perkins in Bangor, Maine, USA in 1849. The formula consisted of morphine sulphate (65 mg per fluid ounce), sodium carbonate, spirits foeniculi, and aqua ammonia. 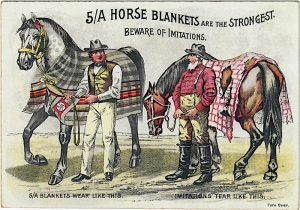 It was claimed that it was “likely to sooth any human or animal”, and it promised to effectively quieted restless infants and small children, especially when they were teething. 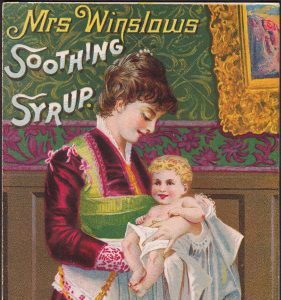 In addition to morphine, Mrs. Winslow’s Soothing Syrup contained plenty of alcohol, so it’s not surprising that the syrup put infants to sleep. The additional claim that the syrup would cure diarrhea was also true, because one of the common side effects of opioids is constipation. 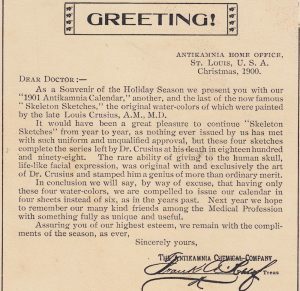 In 1911, the American Medical Association put out a publication called Nostrums And Quackery where, in a section called “Baby Killers,” it specifically called out Mrs. Winslow’s Soothing Syrup. 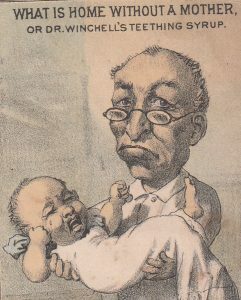 Dr. Winchell’s Teething Syrup, like Winslow’s, contained enough morphine to quiet even the loudest of wails. 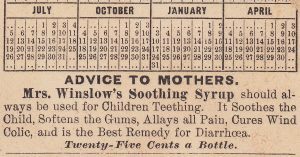 Like the Winslow cure, the popular Dr. Winchell’s Teething Syrup remedy contained morphine, and it was also specifically targeted to households seeking a reprieve from a crying child. 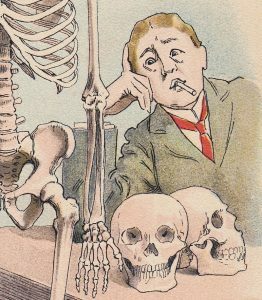 But while the beautiful full-color Mrs. Winslow’s advertising cards show the bliss of a child at peace in a radiant mother’s arms, the classic Dr. Winchell card depicts in subdued and forlorn hues a pathetic papa “before” he discovers the miraculous transformations possible with the good doctor’s drug. 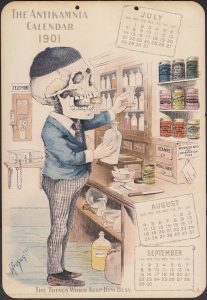 Laboratory analysis proved otherwise, and Dr. W’s remedy (which promised to “absolutely cure every case”) was another dangerously potent product targeted by the Pure Food and Drug Act of 1906. And why not? It certainly worked. 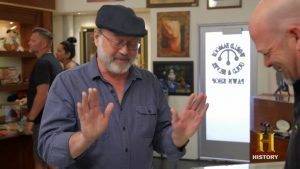 Nobody could deny the ensuing quiet after only a few drops. Well, as it turns out, America had a whole generation of babies struggling with the pain and damage and trauma of withdrawal, thanks to this deadly teething syrup. It is uncertain how many children actually died from these syrups, but the number is estimated to be in at least the thousands. 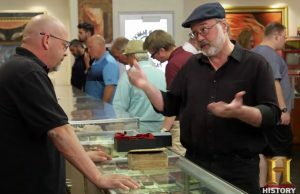 Many doctors, let alone parents, were ignorant of the unlabeled contents of popular medicines, and the effects of many of these strong drug combinations were still being researched, documented and challenged by industry powerhouses like Mrs. Winslow’s. 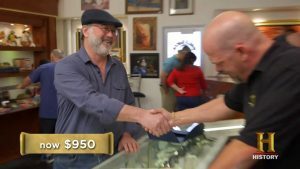 So we’ll never know the toll and damage for sure. In this card image, a Victorian mother snuggles with two children in bed. 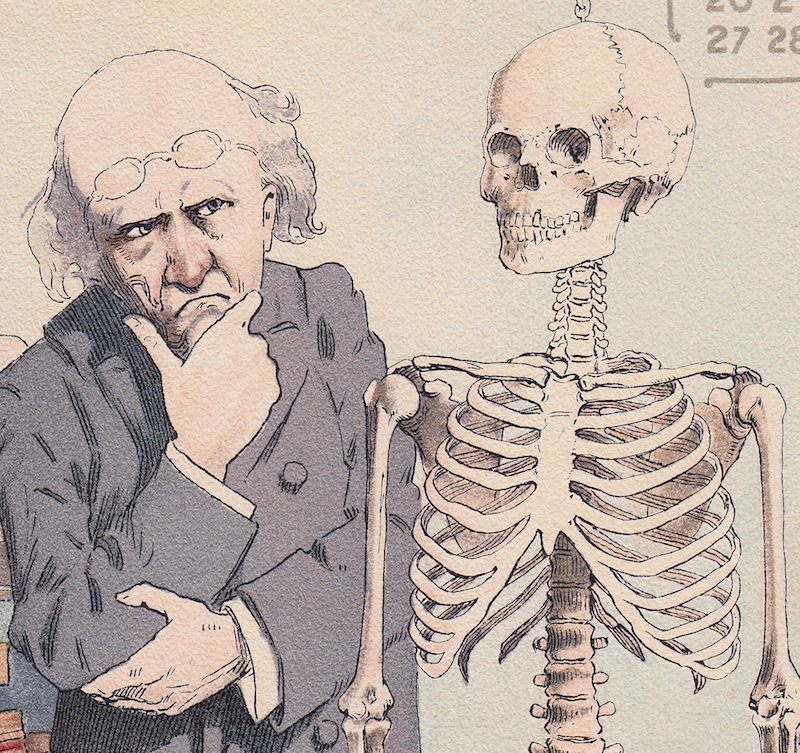 Together, she and her oldest examine the paper, which carries a full page illustrated ad for Mrs. Winslow’s cure. The teething child tucked within her right arm appears dreamy eyed, perhaps because of mother’s soft comfort, or perhaps from the morphine and alcohol from the open bottle on the night table. 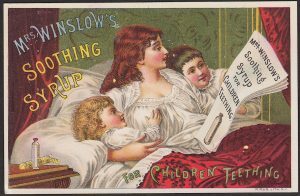 The classic Mrs. Winslow’s deadly teething syrup bottle is a 5 inch cylinder shape, and depictions of the bottle and wrapper appear in their Victorian trade card ads. Bottles in others sizes can also be found, as well as examples with embossing variations from the UK and other parts of the world. Lovely Victorian Baby Bassinet with bottle of Mrs. Winslow’s Syrup on the table. 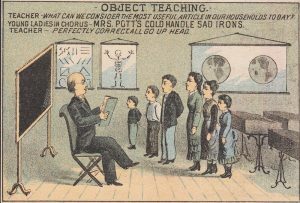 Future blogs will explore this in much more depth, but in passing, I’d be remiss if I failed to mention the treatment of women and motherhood in the Mrs. Winslow ads. 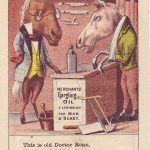 By the 1880’s, the Winslow patent medicine empire was powerful and far reaching, and they could afford to employ some of the best marketing people of the day. 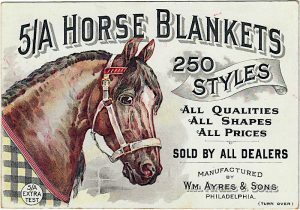 They issued recipe books, store signs, newspaper ads in almost every city, and even colorful hand-held advertising fans. 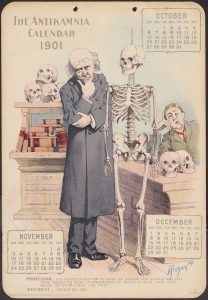 But their most beautiful and enchanting work was reserved for their Victorian trade cards. 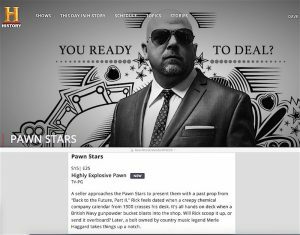 In these idealized visions of the “Good Life” in American, we observe healthy, well-dressed women enjoying the privileges of leisure and wealth. 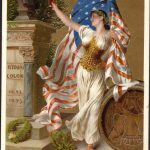 For many American women, the days were long and hard, if not dusty and brutal. The romanticized images presented by Mrs. Winslow’s Syrup held up glimpses of what many hard-working women and impoverished mothers aspired to attain, but few would ever realize. 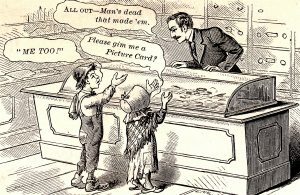 Bottles of deadly teething syrup were sold by the millions, partly because of these cards. If the exhausted mothers of the 1800’s could not actually live the lives depicted in these ads, perhaps they could quite their crying infants for a few hours of rest… and dream. 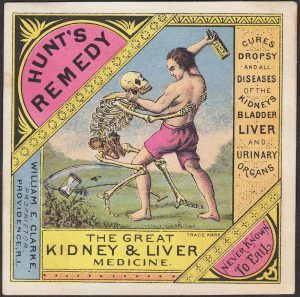 Check back for future blogs on Patent Medicine Advertising and 19th Century Visions of the “Good Life,” as well as many other fascinating Victorian Card topics and visual themes!